Bravo Delivers Results For 'Top Shelf' With Robots In L.A.
Bravo debuted Top Chef in 2006, pioneering a new genre of reality food TV. Two Emmy wins, 26 Emmy nominations and 14 seasons later, Bravo wanted to market Top Chef Season 15 on its trusted, differentiated characteristics of elevated and innovative food to reel in new viewers and bring back current fans. It set out to lead the charge in food innovation. Essence and Bravo partnered with Postmates to launch the first-ever robot delivery service in the buzzy L.A. market. Top Chef-branded robots rolled through the streets of Hollywood, catching the eyes of pedestrians and the attention of media (CNBC, Food & Wine, AdAge, US Weekly, to name a few). The robots made their way into the homes of Bravolebs like Josh Altman (Million Dollar Listing LA) as well as Tom and Katie Schwartz (Vanderpump Rules) and served five-star meals from Top Chef winners’ restaurants like Sweetfin Poke (Dakota Weiss, Season 9) and Mexikosher (Katsuji Tanabe, Season 12). 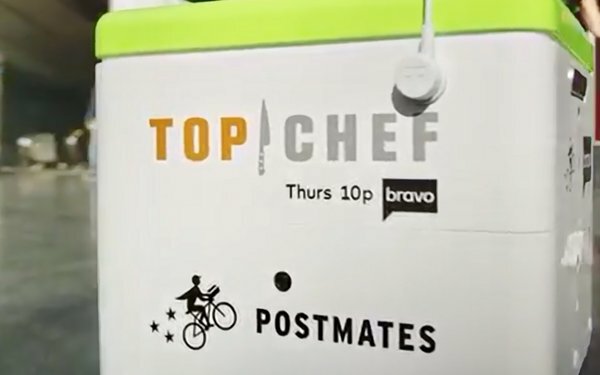 To get the word out, the partnership included a Postmates app takeover across L.A., letting users know when robot deliveries were live and sold out for each day; national post-order interstitials sharing a Top Chef Season 15 trailer with consumers while their order was in the works; and an in-app talent integration, where Top Chef host Padma Lakshmi showed L.A. users what to expect from their robot delivery. Continue to leverage first-to-market opportunities that are relevant to the campaign and tie back to the overall strategy. Align with brands that are reshaping food culture to bring a product into people's homes in new and exciting ways. Infiltrate a major market with an app takeover. This campaign won a MediaPost OMMA Award in 2018. It was also a finalist in the New/Emerging/Experimental category in MediaPost’s Creative Media Awards. Must-read daily news for media planning and sales professionals. Must-read daily news for brand, product, service marketing execs. Advertising and agency news, campaigns, accounts and more. Must-read daily news for the television industry. Must-read daily news for the publishing industry. Must-read daily news for the email marketing industry. Must-read daily news for the search marketing industry. Marketing to the Internet of Things. Daily email marketing news from the UK and EU. Daily advertising news from the UK and EU.